Here’s a phrase. Dave blew it today. That’s a harsh verdict because he used PMQs to focus on Haiti and the Doncaster torture case. Naturally Haiti dominates the news and we all know that vulnerable kids have a very special place in Dave’s heart. But this is a political scrap and he needed to show a bit of muscle in the house. Rather than cultivating his finer instincts he should have strutted into the cockfight and blasted some of Gordon’s feathers off. As it was he elicited little of value from the Doncaster case and dug himself into an unwinnable dispute about whether the review should be published in full. The Labour backbenches gave another disciplined and well-drilled display. Question after question supplied Gordon with a chance to highlight some Tory policy which they regard as iniquitous. Emily Thornberry asked the PM if he cared to advise a couple who are contemplating marriage. ‘Should the government give them some money and if so how much before they tie the knot?’ ‘It’s the Tory party that’s tied in knots,’ laughed Gordon. Gregory Barker quoted a group of 60 senior civil servants who had called the government weak and incoherent. Gordon smiled back, ‘He’s going to have to do better than that.’ This can be taken two ways, however, and a barrage of Tory howls suggested that Gordon might have gaffed. But he changed the subject and extracted himself from peril with a prepared gag. ‘When the Conservatives said there’d be one new policy a day I didn’t realise it would be one new policy a day on married couples allowances.’ Riding a wave of self-confidence he even managed to turn a question about a leaking dam in Lichfield to his advantage. Michael Fabricant begged for help from general taxation to fund the repairs. ‘I see he’s making the case for public expenditure,’ said Brown smoothly. Brown had plenty of scripted jokes today. And when your prepared stuff goes well, you know you’re flying. To highlight Tory divisions over tax he reminded us of Ken Clarke’s reaction to the proposed reward for married couples. ‘This is social engineering for God’s sake,’ Brown quoted Clarke as having said. ‘My wife didn’t put up with me because she was getting an extra £150.’ Clarke was in an unhappy position squashed like a pillow between two large colleagues and he blushed and giggled awkwardly at this recycled quote. What an image. Plump, pink, puffy and chortling foolishly, he offered a perfect snapshot of the Tory past which Brown is so keen to evoke. Dave handed the advantage to Gordon today and the PM helped himself to an easy victory. 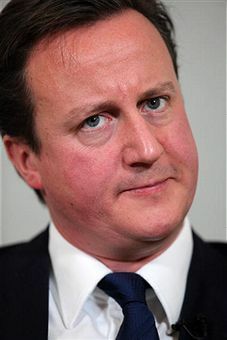 Cameron risks turning into the Rafa Benitez of Westminster. He’s living on a reputation which is rapidly fading from memory.